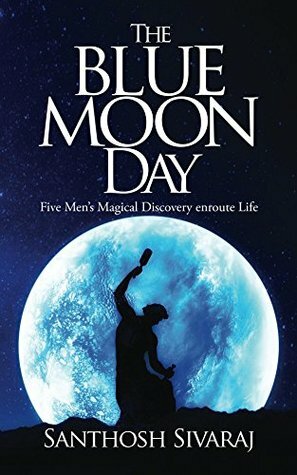 The Blue moon day is author's debut book. It's a story about five different individuals Abi, Deepak, Vivi, Sankaran, and Prabha. They were lost in their lives. Each individual has own story and struggles. Abi wants a good job. Deepak wants his love Priya. Vivi is hanging between job and family. Sankaran who is living in an old age home wants his family. Prabha wants to live a healthy life. They all go through a dark face in their life until a ray of hope comes and change their lives completely. The author describes each of their story in separate sections. Each story is divergent than other but the teaching and end are the same. We all know that one person who brings positivity in our life. In this story, an old man helps this five people to achieve their happiness. He gives purpose to living. He is kind of Santa Claus who knows what you want and what is stopping you from finding it. One can easily connect with characters. I really like the concept of Zero mind theory. In this theory, a person can do all the work which he/she didn't do in ages without giving any single thoughts. I applied this theory to my life and I must say I am very impressed by the results. "There is no way to happiness. Happiness is the way." The author writing is simple and easily understandable. There are a few errors in the book. He did a good job but still, there is a long way to go. The author said - "Just as writing fast is a talent, Reading slowly is also a virtue. I would recommend that you read this book slowly, to gain the most from the experience." But it's a quick read. I complete this book in 2 days. One can finish it in few hours as well. So it's your choice you want to read it slow or fast but it's a must-read. It does not extend unwantedly and good for newcomers too. Things were never the same for five ordinary individuals who were lost at crossroads and there was no back way. They had no other choice but to take a plunge into their deepest fears and leave the rest to destiny. The individuals were tested away from their comfort zones and it produced abstruse results: a Ph.D. scholar fights to win a pizza-making contest and a tennis prodigy runs for his life on a war-torn, bloodied island. Extreme circumstances and their consequences made these ordinary individuals extraordinary. Was the test imposed on them by someone? Or did they invite it on themselves? Blue Moon Day is that once in a blue moon story which questions an individual's priorities, ridicules worldly routines and finally redefines happiness. Santhosh Sivaraj is a banker based out of Chennai who has worn many hats in life - sailor, teacher, trainer, and entrepreneur. He considers the journey of life to be the destination in itself and that pushes him to seek newer avenues in life. Absurd Economics interests him and he loves doing standup comedy. He laughs at his own mistakes and loves life unconditionally. PS- Get a free copy in exchange for an honest review. Thank you.